No More Not Cooking began as an attempt to put an end to my own totally pervasive not cooking behavior. Characterized by a stunningly stubborn lack of ability and no-can-do attitude, I was a non-cook of the basic can’t cook style, ever so lame in the kitchen. This lameness was underscored by the presence of my beloved husband, who is an absolutely, fabulously, famously among our friends, naturally talented cook. Plus, I had become a mother, which had me looking at the way my son (and not too long after that, my second son) would see me. The unexamined not cooking became the embarrassing not cooking. I didn’t like seeming so helpless, hopeless. Or not seeming. Actually being. It was the being helpless and hopeless that bothered me. I decided to launch No More Not Cooking, a project where I asked five trusted friends, who are very good cooks in very different ways, to help me by teaching me an informal cooking lesson. I declined to ask my beloved husband to act as one of my teachers because secretly part of my goal was to impress him with my new skills, but definitely not to reveal the depth of my ineptitude. These lovely, cooky friends took the place of cookbooks because I would never want to spend an afternoon with a cookbook but I love to spend an afternoon with a friend. Especially the kind of friend to whom I feel close enough to impose on for a cooking lesson. Especially the kind of friend who would take me on as an almost certainly hopeless student!I documented each cooking lesson with photographs of my cooking teachers and the whole skinny on how we cooked what we cooked. At the end, I made a little booklet out of my documentation. If you'd like to, you can look at a copy of the booklet here. As time went on, I kept going with my No More Not Cooking project beyond the original five lessons, but instead of making more booklets, the accounts of those cooking lessons were published in a little magazine where I live called Edible East End. Those were published with nice photos of my cooking teachers taken by the photo editor of the magazine. You can see the pictures and read those articles here. However, the fate of No More Not Cooking (as a way to become a cook) was to join the ranks of the projects of the past. Too bad for it. Too bad for cooking! The thing was that the cooking was not my thing. It became clear that on top of needing people to teach me to cook, I needed people to teach me to want to cook. And picky grouchy non-cook that I am in my heart, I’m not sure that the latter can be taught. At least, I’m pretty sure that it cannot be taught to me. So as it turns out, a good function of the No More Not Cooking project is to find out that you are a non-cook! It could also be used to confirm the suspicion that you are a non-cook. 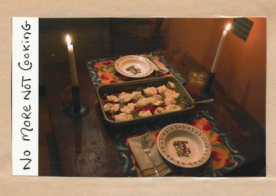 Here is the picture on the cover of the No More Not Cooking booklet I made to document my No More Not Cooking project. You can look at the whole thing here.